Colorless glass, cut. On the front side embossed medallion. 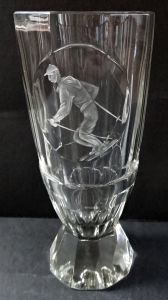 Decorated with engraved figure skiers. The massive base in the shape of a column, bevelled cut vertical facets. Cup of conical shape, cut into vertical facets. Bottom embossed horizontal ring. Bohemia 1920 - 1940. Height 18 cm, width 8 cm.